A custom name server allows you to run your own name server to respond to DNS requests for your domains. You can also decide to setup custom name servers for branding purposes, if you would like to hide the fact that your domain's DNS requests are handled by our public name servers. Shared and Reseller hosting customers can achieve this same branding affect for their domains by instead setting up vanity name servers. Are you using our public name servers? You can use our domain routing tool to see if your domain is pointed already at our public name servers. Or you can follow the steps below to check your domain's DNS records directly from your computer. Open a command prompt window by going to Start and then typing in cmd and hitting Enter. If your server has been setup with custom name servers, but your domains are still pointed at our public name servers you'll want to update these so that they are using your custom name servers instead. You should have already at this point been given custom name server entries by our system administration team, or you specifically requested for them to be setup. For this example we'll be using the fake domain name MyCustomNameServer.com. Login to your domain Registrar where you registered the MyCustomNameServer.com domain name. Most Registrars will have a section similar to Maintain name servers under this domain, or it's sometime referred to as glue, or host records as well. Typically you'll just need to enter in the part before your domain name ns1 for instance, and then the IP address you were given for the custom name server. Repeat the same step again for the ns2 host as well. 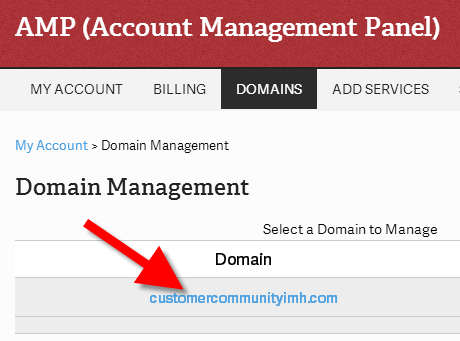 Now update all of your domains to point to your custom name servers. If your domain is register through us, you can activate (also knows as glue) your Custom Nameservers in AMP. 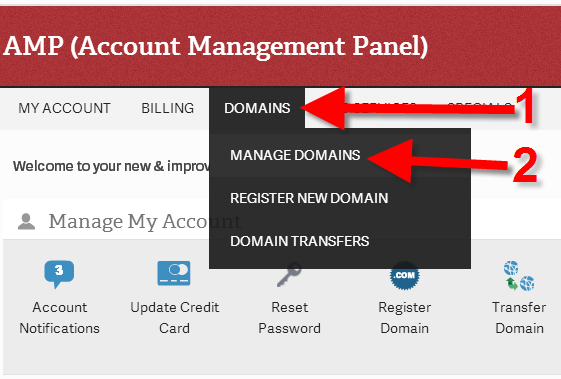 Move your mouse over the DOMAINS menu, and click the MANAGE DOMAINS link. Click the domain name you want to edit from the list. On the next screen click Create custom nameservers. You will then see your new nameservers listed. After making DNS changes like this, it can take a full 24-48 hours for the settings to fully propagate. Once they have updated, you should be able to query your domain's name server records again, and it should come back with the custom name server settings as the active name server addresses for that domain. Go to Home > DNS Functions > Edit DNS zone. Select your main domain from the list and click Edit. You will see your ns1 and ns2 subdomain entries for your custom nameservers. The IP is located there. See image to the right. I am trying to transfer my domain name servers. currently using bue host.. trying to transfer to inmotion... when i enter the inmotion ip addresses it says invalid ip addresses... what can i do to be sure i have the right ones? I would recommend contacting our Live Technical Support 24/7. There are account specific details that would need to be known in order to advise how you should register your name servers, like the IP address assigned to your account and the type of account you have (reseller, VPS, dedicated, etc). They should be able to get you setup properly with the information they can obtain when they review your account and domain setup. In my VPS can I have vanity nameservers for certain domains or do I have to have a single custom nameserver for all the domains? Yes, you can use any domain you want for your custom nameservers. 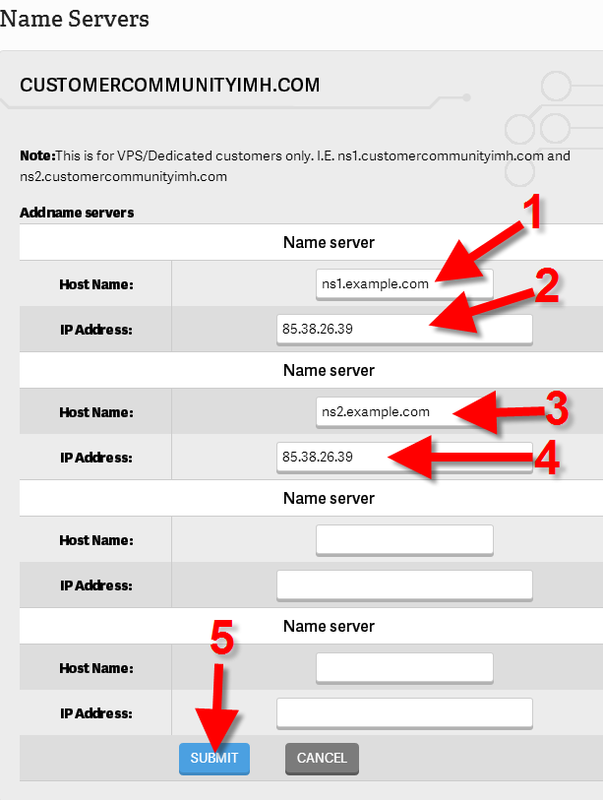 Also, individual cPanel accounts can setup vanity nameservers. I have a domain registered in not in inmotionhosting. Inmotionhosting helped me set-up a CUSTOM NAMESERVER. Will it work or is my website accessible if my domain is not registered in inmotionhosting? Yes, your domain will work even if its not registered at InMotion Hosting. You will want to use A records to point to the correct servers. Watch this video as it better explains it.